Does My Company Have to Post the OSHA 300 Form? OSHA 300 Log: Do I Need to Post the Form? The OSHA 300 log is part of a federal requirement concerning safety in the workplace. It is a form that must be filled out by employers and displayed in a visible area. The log records all applicable injuries or illnesses that occur in the workplace. It must be posted every year between February 1 and April 30. The OSHA 300 log is not required for businesses with 10 or fewer employees and for businesses in some types of industries. The OSHA 300 document must be located where it is visible to all employees and where business or operations are conducted. The form has three main sections: identification, description, and classification. Identification includes the name, case number, and job title of the injured person. The description section includes the date the injury occurred, where it occurred, and a brief description of the injury. Classification describes the result of the injury, such as death or missed work, as well as the general type of injury or illness. What and When to Report? The log must be maintained according to the calendar year, not the fiscal year. The information shall be posted within seven days after a recordable case has occurred. Employers must keep injury and illness records for each establishment. When employees do not report to work at the same place each day, then records must be kept at the place from which they are paid or at the base from which they operate. The forms must be posted and maintained by all employers, even if no recordable injuries or illnesses occurred during the calendar year. 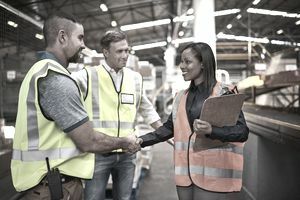 Equivalent forms provided by the employer's insurance agency may be used, but they must include the same information as required by the OSHA 300 log. In addition to the OSHA Form 300 log, employers must maintain OSHA Form 300A: Summary of Work-Related Injuries and Illnesses, and OSHA Form 301: Injury and Illness Incident Report. Workplace safety evaluations can be analyzed to determine safety issues. The summary of events can be used to identify and prevent repeated hazards. Injury records from previous years can be used to focus and enhance safety measures around certain hazardous activities. The OSHA 300 log can be used to check records during ongoing investigations or claims. The OSHA form 300 A log must be posted every year by February 1st of the following year, summarizing all injuries from the previous year. The log must be visible from February 1st until April 30th. However, it is important to understand that if an employee asks for a copy for their injury report, the employer is required to provide them a copy of the OSHA 300 log before the end of business the day following the request. The log must also be signed by a company executive or authorized representative, indicating that the information is true and accurate. During an OSHA inspection, the 300 log will normally be the first document you will be asked to provide. Failure to maintain and present the log can result in a fine of up to $8,000 for each year of the violation. Business and construction industries can face penalties of $1,000 for every year they fail to maintain the OSHA 300 log form. There is also the possibility that a separate citation could be issued for each OSHA 301 form not filled out completely or incorrectly. Who Is Exempt From Maintaining the Log? A list of exempt industries can be found on OSHA’s website. However, the Bureau of Labor Statistics may still select exempted employers to participate in an annual statistical survey, and employers must visit the OSHA website for the latest regulations and requirements pertaining to the reporting and recordkeeping guideline.